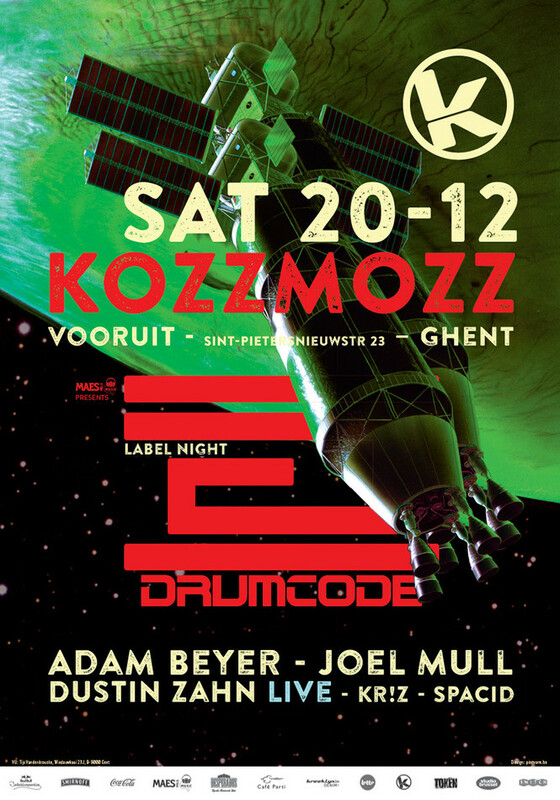 It’s been two years now since our comrades of Unit Drumcode set sail to our dear Planet K. Ever since, they’ve roamed many galaxies throughout the universe and now they’re ready to board our spaceship once again. As you should know, living an interstellar existence can be very stimulating when it comes to creating techno sounds and that’s what they’re coming to prove to us. Let's put it this way, have you ever heard a star erupting from a red nebula while a meteor storm is soaring past your spacecraft? It’s intergalactic madness! The madness will be lead by Drumcode captain Adam Beyer who’s music is synonymous with all that is exciting about techno. Having emerged as the figurehead of the hugely prolific Swedish techno scene, Beyer’s focused and considered approach to his craft has worked to confirm his position as a globally recognized DJ and producer headlining cutting edge clubs and festivals week-in-week-out. Adam is also one of the most acclaimed production talents on the scene and has consistently delivered cutting edge music across his 3 labels – Drumcode, Truesoul and Madeye. Over the years he has also built up a highly prized roster of talent and his meticulous ear for quality productions is highly renowned. His Drumcode events have achieved much praise across the globe and his highly respected weekly ‘Drumcode live’ FM radio show is broadcast on over 40 stations worldwide with the podcast having already achieved well over 3 million downloads. He’s boarding the ship with one of his life-long friends and fellow Swedish producer Joel Mull. Joel Mull has been around for quite some time and the list of labels he had produced for is huge. Lately Joel has done a lot of collaborations as with Cari Lekebusch on H-Productions or Ida Engberg and Jel Ford on Drumcode. This year we can also find several solo productions on diverse labels as Thoughtless Music, Last Night on Earth, Mood & Waveform Recordings. He used to be a regular guest at Kozzmozz when we started our interstellar voyages but now, it’s been almost a decade since we had him over so welcome back Joel! Next up is Dustin Zahn who released his second album ‘Monoliths’ on Drumcode earlier this year. Next to that, he’s also very active on his own Enemy Records. It’s his remixes however that have helped catapult him into the collections of DJs around the globe. As a remixer, he has done work for the likes of Adam Beyer, Chris Liebing, Green Velvet, Dubfire, Nic Fanciuli, Mark Broom, Joel Mull, and many other high profile acts. Although he’s visited our country already a couple of times as a dj, this will be his first live-act in Belgium ever. Live-acts of him are quite rare in general, with the exception of Berghain, so we are very happy to bring you this special treat! So just before Sirius, the brightest star in the night sky, aligns with the three brightest stars in Orion's Belt, Planet K will be transformed into a hyper technological orb. Be ready to be beamed up to higher states with it!